The pace maintenance test for efficiency helps you know when you are ready to start adding speed or more volume to your swim training. The idea behind this test is to see how well your swimming holds up with distance in terms of not only time, but also technique. When you start to get fatigued, one of the first things to happen is that your stroke count will go up. When it goes up, you’re no longer swimming with the same technique. One way to test this ability to sustain an efficient technique is with what we call a “Pace Maintenance Test” or PMT. In the PMT, you’ll swim 4 different distances, with short rest periods, increasing the distance with each repeat…a ladder basically. For each repeat you’ll both TIME your swim and count your strokes. Keep a notebook and ink pen at the end of the pool to jot down your notes. 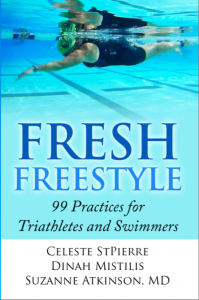 Your objective is to swim each repeat at the same pace with the same stoke count. Rest for 20 seconds between each repeat. If you are aerobically well trained and your technique is sound, you’ll swim the final repeat with the same SPL without slowing down. If you either slow down OR your SPL goes up, then you will benefit from both drills and focal points to improve technique combined with swimming more frequently to help improve aerobic fitness. On the other hand, if you are successful at sustaining time and SPL, then you’re ready to advance your swim work in the form of faster sets, higher tempos, longer repeats, an extra swim session per week, or more total volume in your swimming. There are lots of ways to measure technique and improvement but the PMT (Pace Maintenance Test) is a great benchmark to try once every few weeks.